Parking at Rotterdam airport is often an expensive service. More and more people are discovering the valet parking solutions at Rotterdam Airport. 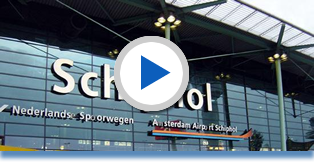 When using our valets, simply drive directly to the Rotterdam Airport departure area. One of our professional drivers will park your car just outside the airport at one of our secure parking facilities. Upon your retu, your car will be waiting for you at the entrance / exit of the airport building. You can get back on the road to your home or office straightaway. Whether you opt for short or long-term parking at Rotterdam Airport, Centralparking always offers fast service using professional drivers. To offer you prompt service, drivers are available to meet you at the airport or to retu your car to the airport 24 hours a day. And if you need last-minute valet parking, we can guarantee a quick response time. Through long experience, Centralparking has grown into a service-oriented business that serves hundreds of travellers each day. In 2013, over 3.4 million passengers travelled through Eindhoven Airport, resulting in approximately 25,000 flight movements that year. 2014 saw a ten per cent increase in the number of passengers.